With a spine that’s properly aligned, your nervous system can flourish. At Pinkus Family Chiropractic, chiropractors Dr. Brenton and Dr. Katie focus on adjusting the vertebrae of your spine using various techniques to correct subluxations. These forms of interference in your nervous system can cause a myriad of problems. When corrected, you can experience benefits of chiropractic such as a higher quality of life and an enhanced connection in mind and body. If you start care while in pain, we usually recommend about 12 appointments, then do a progress evaluation to see how you’re responding. Once your problems have been addressed, we’ll discuss wellness care, which can prevent your issue from recurring. This stage of care involves less frequent visits. 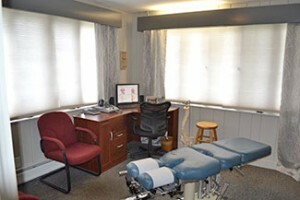 We’ll walk you through each step of a chiropractic adjustment before beginning. Prior to lying on the table, we’ll discuss each part and make sure you’re comfortable. We have many techniques that can be used, such as Diversified, Thompson, Toggle Recoil, Activator®, Sacro Occipital Technique® and Flexion-Distraction. If you feel achy after your first few adjustments, rest assured that it is a normal reaction, and you can apply ice like you would any other sore muscle. Contact our Manchester office today to get started! Once you become a member, we welcome you to stop by for convenient walk-in appointments.